Mahindra & Mahindra introduced a brand new MPV in the form of Marazzo at the beginning of September 2018 with prices ranging between Rs. 9.99 lakh and Rs. 13.90 lakh (ex-showroom). Taking design inspiration from Shark, it can be had in seven- or eight-seat configuration and is part of the new generation products Mahindra has lined up for the domestic market. The Marazzo is enduring a very decent run in sales so far and within 45 days of its market entry over 10,000 orders were taken. The Marazzo is the collaborative project of Mahindra’s technical centres across the globe and its Italian design house Pininfarina and it has been crafted with global standards and its newly revealed Global NCAP crash test rating stands in testament to that. The Marazzo was put through all the assessment tests at ADAC Crash Lab in Munich, Germany. The production model used for testing is the base-spec Marazzo with dual front airbags and ABS with EBD as standard. Under the Global NCAP procedure, the Marazzo was frontal offset tested at 64 kmph. The MPV is evaluated to have good structural integrity of the body shell with no deformation of door frame or crucially A-pillar. The crash tested Marazzo covered about 70 metres at 64 kmph before ramming onto the stationary structure. The results were nothing but impressive as the all-new model has been rated as the most safest Mahindra ever, and is the first made-in-India MPV to achieve a highly appreciable four-star rating. It is important to note that none of the India-made MPVs like Renault Lodgy had scored even a single star, barring the Honda Mobilio with 3 stars. The Mahindra Marazzo fared exceptionally well in the adult occupant protection test by receiving four stars with 12.85 out of 17 marks and two stars in child occupant protection with 22.22 marks out of 49. The largest UV maker in the country will use the Marazzo as a test bed in pursuit of gaining 5 stars for future vehicles from Global NCAP, whose crash test procedures are far more advanced and stringent that what is currently practiced in India. 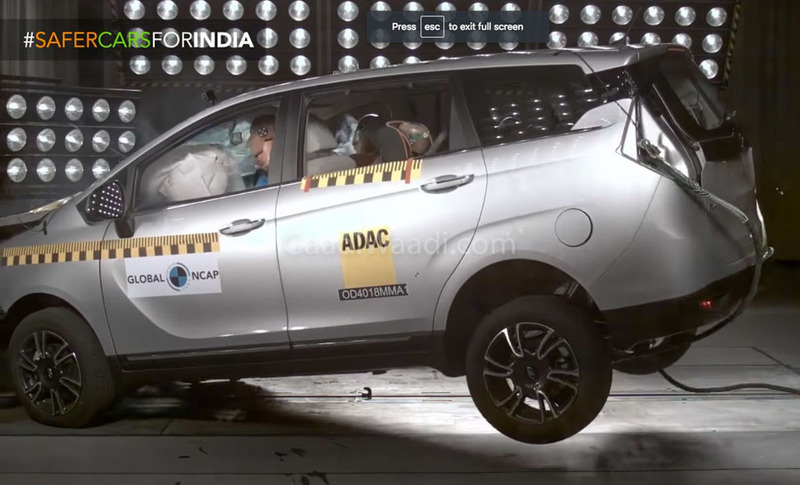 The Marazzo with four stars and the Tata Nexon with first-ever five stars for an India built car from Global NCAP squashes the myth that locally made cars are not safer and richer in quality compared to global cars by a larger scale. It is certainly a proud moment for the Indian auto industry.